From Guy Bolton of Greasy Kulture magazine. 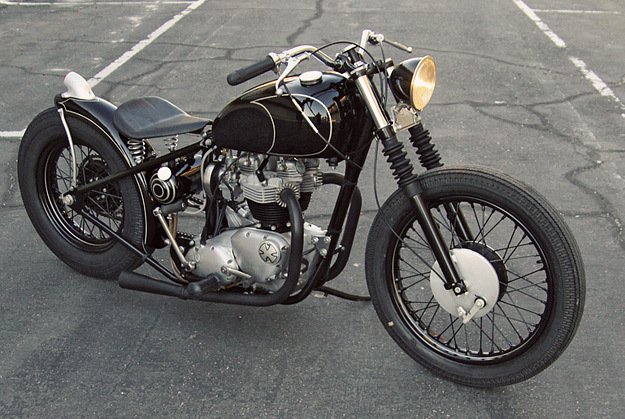 For a long time, Jon Rispante of Nevada wanted to build an all-black 1970 Triumph Bonneville custom — ‘murdered out’, as the hipsters might say. 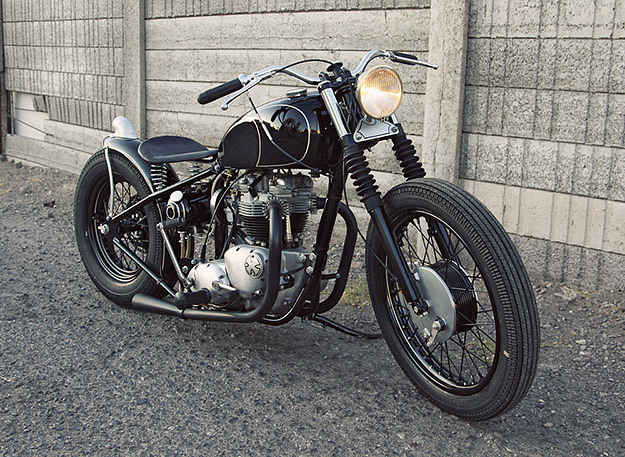 Here’s the result, a combination of three different Triumphs that Jon had sitting around. The Bonneville engine was given a full rebuild, and treated to a TR6 single carb head, Boyer electronic ignition and a MAP Mikuni kit for rideability and reliability. The headlamp is a Model A Ford auxiliary lamp, and the tires are rare NOS Goodyear Super Eagles—19” on the front and 16” rear. Jon wanted a ‘no frills’ look to this bobber, so he gave the engine cases and other shiny parts a low-key, brushed aluminum finish. The paint is by Carlos from Cool Hand Customs—with pinstriping by Chris Clark—and Chris Nichols built the custom leather seat. In the end, Jon achieved his aim: “No chrome, no glitz. 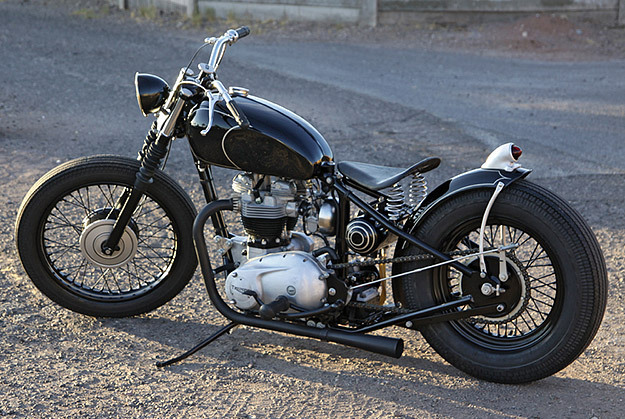 Just a clean, all-business, 40s/50s-looking motorcycle.” Love it. Jon’s 1970 Triumph Bonneville is featured in the latest issue of Greasy Kulture: order your copy here.